The Royal British Legion works year-round to support those who have defended our freedom. Strangely we only seem to remember this around September/October when poppies are commonly on sale (in the UK anyway). But it was actually in April five years ago that Surrey Guild of Craftsmen member (and current Chair) Nancy Shafee approached The Royal British Legion with the idea of making special edition poppies to raise funds for the charity. Interviews followed and a contract which she has renewed each year. During discussions she discovered that apparently the RBL encourages ‘small licence holders’ so she’s one of a growing band of felters, stitchers, knitters and crochet enthusiasts who produce pretty handmade poppies. With a contract these crafters have permission to use the RBL logo marking them out as licenced products. Nancy continues to make as many of these pretty corsages as she can during the year, as well as producing ‘poppy packs’ with all the wool and instructions needed for enthusiasts to make their own. ‘The emphasis is always on quality rather than quantity but still I manage a few hundred every year and of course each one is different. I love teaching people to make them as well and 20% of all my workshops and poppies sold goes to the Royal British Legion’ she says. ‘Felting is a great hobby and anyone can learn – it’s good fun and very sociable’. Nancy is a member of The International Feltmakers Association and current Chairman of The Surrey Guild of Craftsmen. Nancy will be demonstrating at the Festival of Crafts at Farnham Maltings in Surrey on October 28th and 29th. 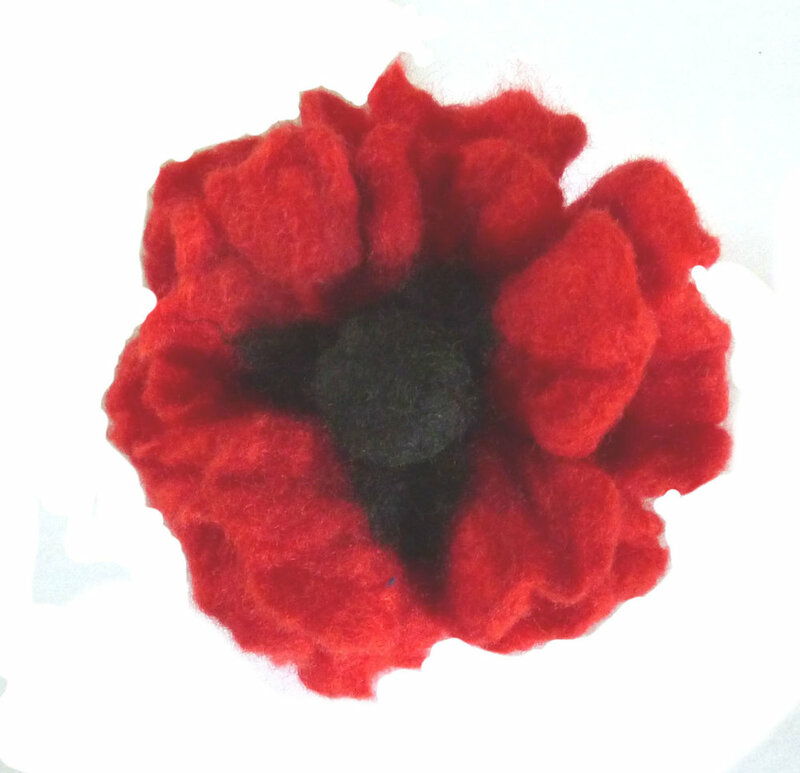 Otherwise, if you would like a poppy, they are on sale throughout the year at The Surrey Guild Gallery in Milford or you can contact Nancy via her FB page: https://www.facebook.com/fantasiesinflight or email flights-of-fantasy@hotmail.com. The Royal British Legion is a registered charity with registered charity No 219279. ** Interesting fact: The phrase "Peace for Our Time" was spoken on 30 September 1938 by British Prime Minister Neville Chamberlain in his speech concerning the Munich Agreement and the Anglo-German Declaration. The phrase echoed Benjamin Disraeli, who upon returning from the Congress of Berlin in 1878 stated "I have returned from Germany with peace for our time." It is primarily remembered for its ironic value: less than a year after the agreement, following continued aggression from Germany and its invasion of Poland, Europe was plunged into World War II. It is often misquoted as "peace in our time", which had appeared long before in The Book of Common Prayer as "Give peace in our time, O Lord", probably based on the 7th-century hymn 'Da pacem Domine! in diebus nostris, Alleluja'. It is unknown how deliberate Chamberlain's use of such a similar term was, but anyone of his background would have been familiar with the original.